Maybe you prefer a home that is decorated with a monochromatic black and white palette but it might get boring after a while so you’re thinking of ways to jazz it up and make it look more stylish. Don’t worry though, that’s what we are here for. 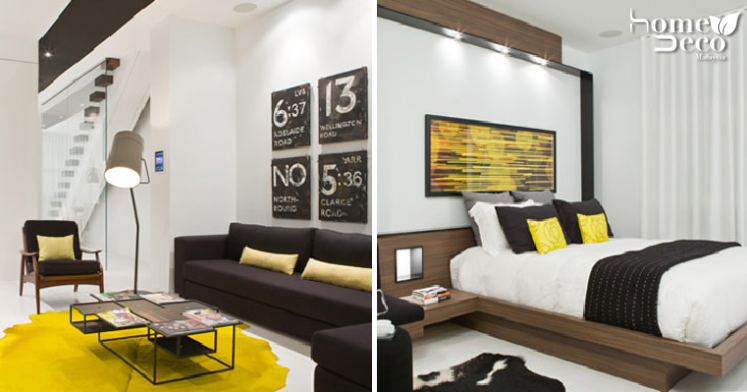 Here we have a glamorous, modern apartment done up in black and white that is livened up with fun pops of yellow all over the house so no one will say it looks boring anymore! You’ll notice that the house has white floors and walls that set the background for the black and yellow decor. In the living room, industrial looking signs are put up on the walls for a rather rugged look while sleek black couches give it a more contemporary feel. This is accentuated by a bright yellow irregular rug on the floor while pale yellow cushions add some colour to the chairs. The kitchen island and countertops are a dazzling white colour and here, the splashes of yellow are seen only as decor in the lemons that act as a centerpiece on the dining table and the decorative containers on the countertop. The dining table is black and paired with some simple wooden chairs that have a unique back made of strings so that it looks rather translucent. The rest of the kitchen decor is warmed up with some walnut coloured wooden elements. The bedroom follows the same theme, but in here, bits of grey are used as well. The striking yellow colours you will spot here are from the abstract painting on the wall right above the bed and some patterned cushions on the bed. The headboard is part of the feature wall made of wood and this connects to the bed frame as well for a seamless look. One cannot forget about the bathroom, especially one as elegant as this. It’s mostly done in white but we really love the whimsical chandelier that looks both futuristic and dreamy. The black and yellow elements here are the towels and a few necessities as well as the lighting sconce that makes it chicer. All images from Trendir unless otherwise stated.